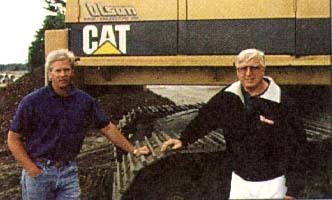 Steve and Mike Olson of Olson Bros. Excavating Inc., pictured standing next to their Caterpillar 235D LC equipped with the OC 102 Depth Monitor. "It's just an outstanding piece of equipment. At first we were hesitant to try the OC 102, but once we started the footings on a project we could tell right away that this was going to be a great investment for us. Instead of checking grade all the time the operator could keep digging, and when we were to grade all that was left was a little handwork," says Mike Olson, President of Olson Bros.
"On our current job it's saved us from using trench boxes and having to put a man down in the hole," adds Bob Medley, Project foreman at Fort Lewis. With respect to ease of operation, Steve Olson, Vice President of Olson Bros. states, "You set in your percentages and go to work. It's really very simple." "The Depth Monitor has let us compete on a dollar basis where other companies can't," concludes Mike Olson.